CLEVELAND — If you're waking up Monday and you're heading to work, there are several weather-related road closures that you should know about. A crash on I-90 eastbound at Ontario Street is causing major delays on the Innerbelt Bridge. Another crash was reported on I-271 northbound after Broadway Avenue, blocking the right lane. A crash was reported on the Jennings Freeway northbound near Harvard. Water main break: Burst water main break on Buckeye Road near Woodland Avenue. Route 45 is closed between State Route 14 and Route 303 because of fallen power cables. Water main break: Rockside Road is closed in both directions between Broadway Avenue and Lee Road because of a water main break. 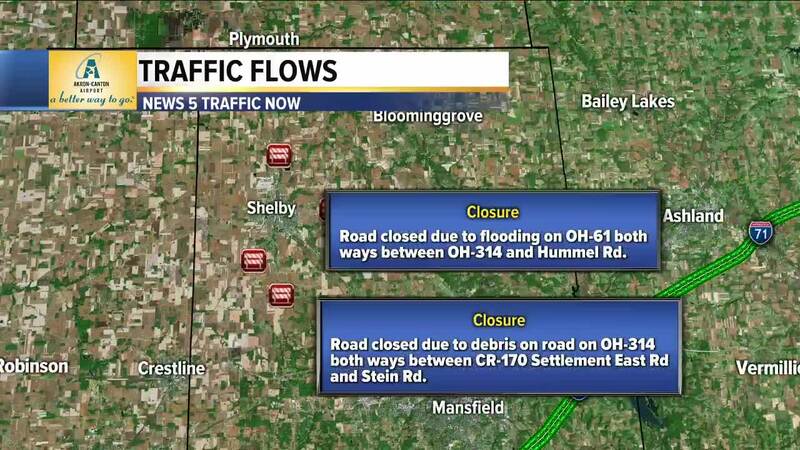 Richland County: OH-61 is closed both ways between CR-59 Hazel Brush Road and Bistline Road. The Chardon Fire Department tweeted out a warning to drivers to treat all non-functioning traffic signals as a four-way stop.